1st August 2018: Shoppers in Brisbane’s inner east are the first in Queensland to experience a new fresh and convenient frontier in supermarket shopping with the official opening of the Woolworths Racecourse Village Ascot store. Located in the new Racecourse Village precinct, the store represents the first time Woolworths has opened one of its next-generation stores in the Sunshine state. With a focus on Australian fresh food and convenient shopping solutions, customers will be able to enjoy a range of features new to Woolworths Queensland stores, including flame-roasted chickens, an array of seafood from a new fish market, artisan breads and made-to-order cakes from the full production bakery. Catering to the busy Brisbane lifestyle, Woolworths Ascot will also feature a new ready meals section filled with fresh sandwiches, salads and healthy juices for customers looking for easy meal options. For those who choose to shop online and pick up their orders in-store, there is a new Drive Thru service area located on the side of the building, with dedicated parking bays for store-to-boot convenience. 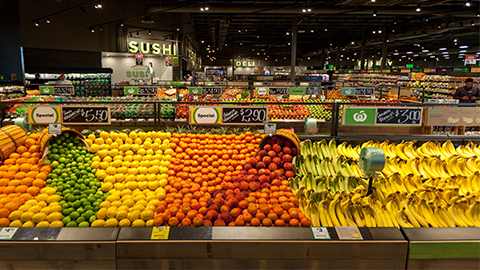 Woolworths Queensland State Manager, Matthew Franich said; “Woolworths Racecourse Village Ascot marks the next evolution of our journey to create a neighbourhood food store for Queensland customers. It provides a great shopping experience for our local customers, with good prices on products they want, a great fresh offer and the convenience they are looking for. The new store draws on many of the elements rolled out earlier this year as part of a renewal of the Marrickville Metro store in Sydney, with some new features added for Brisbane shoppers. As well as the full production bakery, customers can choose from more than 90 hand-picked cheeses from around the globe in the new cheese cave, 100% Australian meat from the in-store butchery, or pop in on the weekend to buy a whole fresh fish from the fish market. The fruit and vegetables section has a refreshed marketplace feel, and support for local producers is also a focus, with products being ranged from local brands such as Maleny Cuisine and Kenilworth Dairies. To reduce the stores impact on the environment and operate the stores more sustainably, LED lights have been fitted to reduce power usage and carbon-efficient refrigeration and air-conditioning systems installed across the store. There is also a dedicated area in-store where customers can bring in their soft plastics to be recycled. Fruit and Vegetables - Customers can enjoy an extensive range of Australian fresh fruit and vegetables in a refreshed marketplace feel. Deli - Designed for entertainers, customers can pick up cured meats sliced to order, their favourite olives from the deli or select from 90 delicious cheeses in the cheese cave. Flame-Roasted Chicken - Woolworths Ascot is doing flame-roasted chicken - perfect for family dinners. The juicy Free Range chicken has been expertly marinated with breadcrumbs, herbs and the juice of half a lemon - and hand-stuffed in-store. It’s then flame roasted for 30 minutes to tender perfection. Bakery - Order custom-made party cakes and fresh made pastries at the bakery, and enjoy artisan bread loaves or freshly-made flat bread perfect for burritos, wraps, and even pizza bases. Butcher - Organic, Heart Smart and locally sourced meat. A new and free ‘Bag and Bake’ service is also available in meat and poultry, including Memphis Smokey BBQ, Cajun Seasoning, Herb and Garlic, and Portuguese Seasoning marinades. Seafood - All of the fresh fish is caught locally from Australia and New Zealand. Try the free ‘Bag and Bake’ offering which has some fantastic marinade options, including tomato and basil, lime and chilli fusion, Thai sweet chilli, roast garlic and herbs, and teriyaki and ginger. Macro Wholefoods Market - An extensive range of certified organic products, including loose nuts, seeds and grains, and gluten-free range to suit various dietary requirements. Sushi - Fresh sushi made to order and handmade by expert sushi chefs. Platter pre-orders also available. Looking for something on your lunch break? There are also hot Japanese dishes on the takeaway menu, including Poke bowls, Katsu Chicken, and Teriyaki Chicken. Pick up - For those who choose to shop online and pick up their orders in-store, there is a dedicated Pick up area at the front of the store and a convenient Drive thru service to the side of the building with designated parking bays for store-to-boot convenience. The new store will employ 127 team members, including 70 new additions to the supermarket team and will be open Monday - Saturday, 7am - 9pm, and from 9am to 6pm on Sundays. Woolworths Ascot is located in Racecourse Village, 188 Nudgee Rd, Ascot.